The Obama administration has asked Congress to approve $1 billion in funding for Central America to bolster security and stem illegal immigration into the U.S. from its southern neighbors. The funding would be spent on programs to promote trade, bolster border protection and help create jobs. Biden said the United States was committed to boosting this support. “In addition to the billion-dollar request for Central America, we’re working with Congress to significantly increase our assistance to you in this region this year because we need to start showing results now,” he said. Honduran President Hernández said increasing opportunities in Central America will ensure regional security. 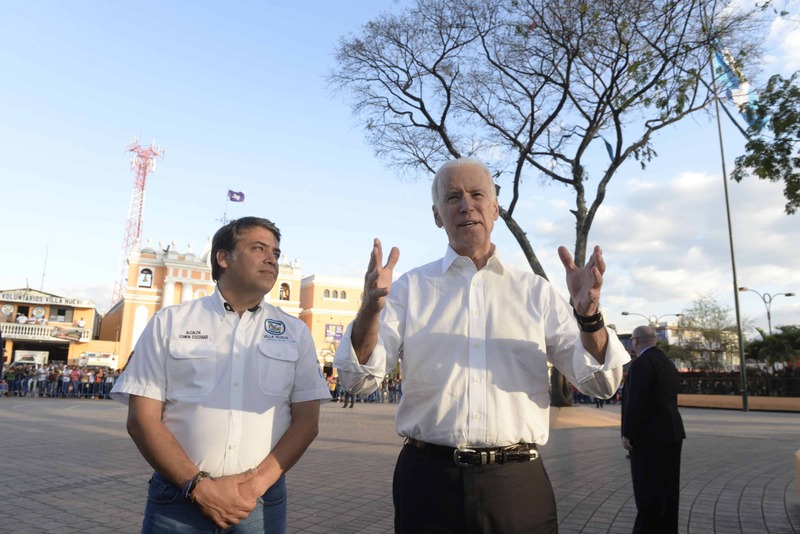 A main purpose of Biden’s trip was to discuss the Alliance for Prosperity in the Northern Triangle plan. The plan was launched in Washington last November to promote “peace and prosperity” in the region — Guatemala, Honduras and El Salvador — in hopes of stemming the flow of migrants fleeing north to escape poverty and violence. The plan rests on four central components: making the region’s productive sector more dynamic, developing human capital, improving citizen safety and access to justice, and strengthening state institutions (see below). Addressing a gathering of business leaders after the presidential meeting, Biden underlined what he described as the private sector’s key role in the region’s development. He also stressed the need to improve tax collection and management, a chronic problem in the Northern Triangle countries. Guatemala, El Salvador and Honduras have among the lowest tax takes in the Western Hemisphere. “The only way to collect the funds needed to invest in your future is to convince others to do the same, to collect and manage the income, making sure it’s managed in an effective, efficient and transparent way, so people know where the money is going,” Biden said. “You hold the key,” Biden told a packed room of business leaders at the Ixchel Museum in Guatemala City. “You need to make a convincing effort to have companies around the world come and invest in Central America, and you need patriotic Central Americans to invest in their countries, not abroad,” he said. During the trip – his second to Guatemala – Biden also met with nongovernmental groups and visited violence-prevention programs. At the site of one program, in the crime-ridden suburb of Villa Nueva, Biden said the U.N.-sponsored International Commission Against Impunity in Guatemala (CICIG) should continue to operate if the country’s leaders wanted U.S. support. Guatemalan President Pérez Molina has expressed doubts in the past about allowing the commission to stay. CICIG was created in 2006 to investigate illegal groups and thier connections to state officials and organized crime.